In radio interview with WJBC's Susan Sanders, I was asked "How do you save seed from pumpkins?" "You know the ones that you have gutted for the purpose of making jack-o-lanterns!" Then I thought about all the pumpkins that take their place on the tops of hay bales and placed in pots of flowering annuals and what does become of the valuable seeds inside. My knowledge of pumpkins was limited to growing them greenhouse as transplants for gardeners. Two years ago, Linda Smith's leftover pumpkin display in our outdoor pots germinated and produces seedlings. I have listened to local legend Mac Condil of the Great Pumpkin Patch take us on a tour of the amazing world of cucurbits at the 2014 Home, Lawn and Garden Show. But I do not know how to harvest/save pumpkin seeds. The first question I asked was "Do pumpkins come true to seed? " No, they are cross pollinated. Pumpkins have both female and male flowers and can be cross pollinated with crops in the same Cucurbit family (cucumber, squash, melon or pumpkin) Cross pollinating does not affect the quality of the pumpkin consumed or used this year. However, the seed you save from that picture perfect pumpkin may not look so great next summer if the seeds you saved were actually a cross of that perfect pumpkin with the squash planted next to it." This is why commercial pumpkin growers separate their crops by at least a half mile to get true seed. If you bought the pumpkin at the store, you may not know exactly how it was grown. If you live close to other gardeners their crops may have cross-pollinated with your crops. Then I asked "How is seed saved from the pumpkin?" 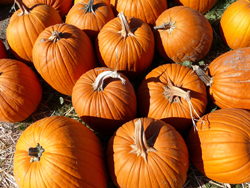 First, choose the largest and roundest pumpkin that perhaps had more resistance to diseases and insect. Second, the seeds are removed from the pulp, rinsed in the colander and laid out to dry for about a month. At Homestead Seeds, seeds from pumpkins, squash and gourds are removed, cleaned and dried, then packaged in amber bottles with custom-designed labels. 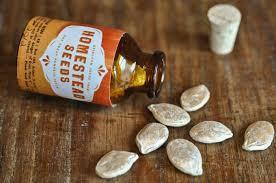 Homestead is a seed company ran by the cucurbit enthusiast Mac Condil from the Great pumpkin patch. When packaged this way, seeds can be kept for three to five years, Mac said, and only loses about 10 percent viability a year. Mac says "one of the keys is keeping the seeds dry and away from extreme temperatures."